A community open house and ribbon-cutting for the new NEX Associate and Family Clinic was held Aug. 28. Onsite medical care is now available for NEX Transport Associates and their eligible dependents at the NEX East Liberty location. On Aug. 1, through a contractual agreement with NEX, Mary Rutan Hospital opened its first employer/employee dedicated health and wellness clinic to provide on-site pre-employment, occupational health and primary care services. “NEX as a company continues to focus on our three pillars of success: Associates, Customers and Community. We strive for innovation and creativity to accomplish these pillars. This clinic is another “outside the box” solution for NEX to accomplish our three pillars,” said Tod Johnson, vice president of NEX Transport. The NEX Associate and Family Clinic administered by Mary Rutan Hospital is designed to address health and wellness, as well as immediate care needs of the associates while managing healthcare costs. “This clinic is a result of Mary Rutan Hospital’s desire to tailor fit healthcare solutions for area businesses and employers. We want to be innovative in delivering local healthcare services; creating custom crafted health and wellness services while utilizing the structure of Mary Rutan Hospital’s local and regional healthcare delivery system. That innovation is possible through the creation of local partnerships with business leaders such as those at NEX,” said Chad Ross, Mary Rutan Hospital vice president of operations. A certified nurse practitioner and medical assistant are on site five days a week to provide quality medical services for associates and their families. The convenience of an onsite clinic makes access to healthcare even easier for NEX associates. In addition, health promotion and wellness is a focus as a whole for NEX, to create a culture for a healthier organization and lower costs. 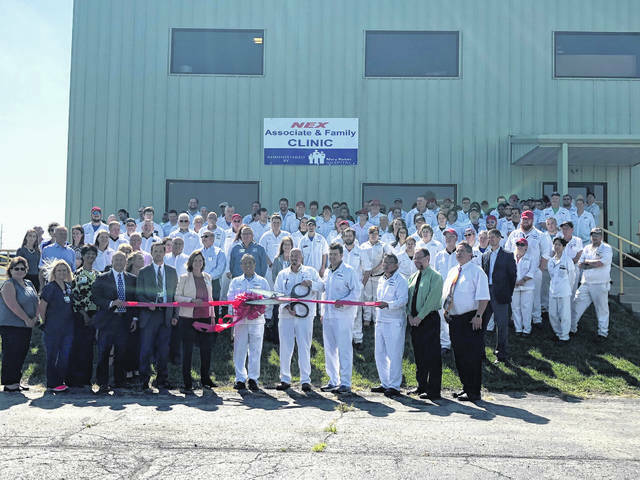 https://www.weeklycurrents.com/wp-content/uploads/sites/13/2018/08/web1_worked-2.jpgA community open house and ribbon-cutting for the new NEX Associate and Family Clinic was held Aug. 28.